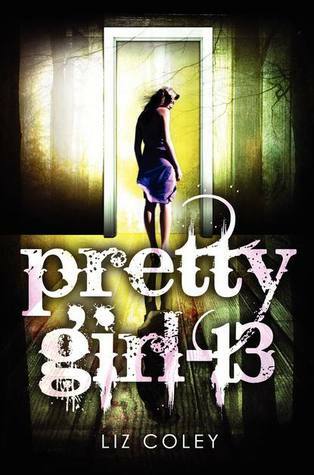 From Goodreads – Reminiscent of the Elizabeth Smart case, Pretty Girl-13 is a disturbing and powerful psychological mystery about a girl who must piece together the story of her kidnapping and captivity. Angie Chapman was thirteen years old when she ventured into the woods alone on a Girl Scouts camping trip. Now she’s returned home…only to find that it’s three years later and she’s sixteen-or at least that’s what everyone tells her. What happened to the past three years of her life? Angie doesn’t know. But there are people who do — people who could tell Angie every detail of her forgotten time, if only they weren’t locked inside her mind. With a tremendous amount of courage, Angie embarks on a journey to discover the fragments of her personality, otherwise known as her “alters.” As she unearths more and more about her past, she discovers a terrifying secret and must decide: When you remember things you wish you could forget, do you destroy the parts of yourself that are responsible? Liz Coley’s alarming and fascinating psychological mystery is a disturbing – and ultimately empowering page-turner about accepting our whole selves, and the healing power of courage, hope, and love. I’ve been fascinated with Elizabeth Smart’s harrowing kidnapping experience since she went missing in 2002, and equally captivated by the graceful public recovery she’s made since she was rescued nine months later. When I found out Liz Coley’s contemporary debut, Pretty-Girl-13, was reminiscent of the Smart case, I was immediately interested. Mentions of Angie’s lost memory and her “alters” were also intriguing. I snatched this book up as soon as it was released. Pretty Girl-13 is an unputdownable novel, one I found myself thinking about even when I wasn’t reading. There is a lot to like: the slowly unraveling mystery behind Angie’s disappearance and “the man” who held her prisoner for years, the complex science behind “fragmented” personalities, the ups and downs of recovering from unimaginable trauma, and the complicated preexisting relationships Angie is thrown back into after emerging from captivity. Without giving too much away, I’ll say that Liz Coley handled the different voices in this story with a deft hand. I found her narrative smooth and easy to follow. Furthermore, I found the way she explained the dense (and occasionally fictionalized) science behind Angie’s condition to be clear and easy to understand. While Angie spends a lot of time in therapy and with doctors, her story never reads as bogged down with medical terminology. Pretty Girl-13 is a difficult novel to sit back and simply read. Angie has an incredibly rough go of it, and there is quite a bit of detail in the descriptions of her suffering. While I understand that Angie’s mind found a way to “protect” her from shock and pain, there were a few occasions during which I wanted more emotion from her. Sometimes I thought she handled her situation with too much poise; she was able to shrug off terribly upsetting news that would have completely undone most people (highlight to read: for example, when she saw the scars on her ankles left by the bindings used by her captor, her first thought was that she wouldn’t be able to wear sandals anymore). I think I would have related more to Angie if she would have broken down a few times, as I imagine I would if faced with her situation. More often than not, I found myself reading Pretty Girl-13 through my Mom Lens, which made it hard to suspend belief in some instances. For example, if my daughter disappeared without a trace for three years, then appeared on my doorstep with huge memory gaps, bearing evidence of disturbing physical abuse, there’s no way I’d ever let her out of my sight again. Angie’s parents, in my opinion, didn’t react to their daughter’s experience with enough intensity or heartache. I found it odd that, knowing what they did about Angie’s mental state, her parents allowed her to baby-sit late at night for the neighbor’s infant. I was also unsettled by the way a certain family issue (highlight to read: Yuncle’s repeated inscestual abuse of Angie) was essentially swept under the rug. I wanted more resolution for Angie in that area, especially considering that it was the catalyst that made her mind ripe for fracturing under distressing situations. My favorite thing about Pretty Girl-13 was Angie’s enduring strength. Despite its difficult subject matter, this is a hopeful sort of novel, one that left me with much to think about, and a definite sense of optimism. Recommended to those who enjoy stories of the psychological sort. Learn more about the Debut Author Challenge HERE. Got 100pgs in the bookstore with this one in under 30 min. SO good. 🙂 So glad you reviewed, Katy!!! It was such a gripping story, Rachel. You’ll have to let me know what you think when you’ve read the rest. Yes I definitely will. I picked up/bought today/read today/cried over today IF YOU FIND ME. Wow. 🙂 Had some issues with it but no book is perfect 😛 Carey’s voice was amazing &I look forward to more of Emily’s books. I loved IF YOU FIND ME! I thought Carey was such a compelling main character. So strong, yet I just wanted to hug her the whole time I was reading! You’ll have to let me know what you think after you’ve read, Jaime. This one had a lot of really strong points, and a few things I questioned. I’m looking forward to hearing my friends’ opinions! This is on my DAC list, and based on your review, I’m so glad it is. Maybe I’ll pick this one up next. 🙂 Also, hooray for spoilers in white! Yes! I totally lifted the spoilers in white idea from you… Thank you for your brilliance! I’m looking forward to hearing what you think of this one, Liz. As I said to Jaime above, there was a lot to like about PRETTY GIRL-13, and just a few elements I questioned. It’ll be fun to see what you all think! Erin, it was REALLY hard to read this one separate from my role as a mother. I kept thinking about how I’d feel if such a thing happened to my child, and questioning every decision the main character’s parents made. That said, it was still a compelling story. I’ll be interested to see what the general reaction is as more and more people read it.